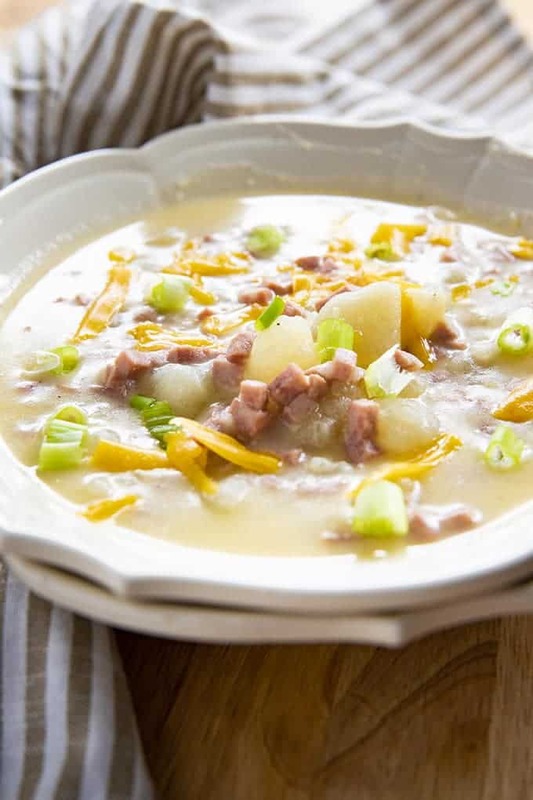 Ham and Cheese Instant Pot Potato Soup is creamy and indulgent! 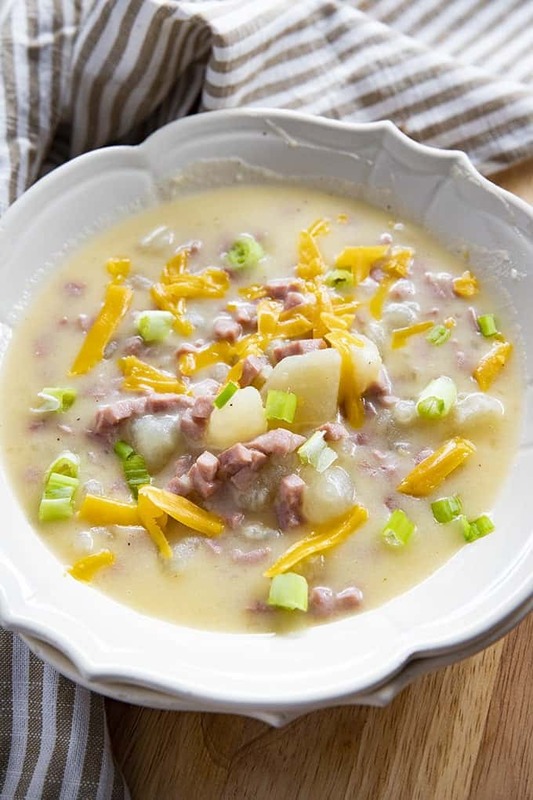 The easiest baked potato style soup made easy in your instant pot full of tender potatoes, ham, and plenty of cheddar cheese! I’ve found myself with some serious soup cravings lately. It doesn’t seem to matter that it’s way over 100 degrees outside. I want a giant bowl of cheesy, homemade, comfort food! Thank goodness for the instant pot. I can make my family some soup to enjoy any time of the year without heating up the stove for an hour! This Instant Pot Potato Soup totally hit the spot. We’ve also been enjoying my Instant Pot Chili during this hot weather over grilled hot dogs! 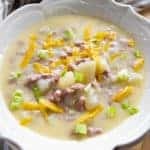 For instant pot potato soup, you start out by simply washing and peeling your potatoes just like you would with any other potato soup recipe. Then, you will cube your potatoes into bite sized pieces, they don’t have to be perfect. You can see the size that mine are cut in the photo below. To save even more time and make this a true “dump and go” recipe, I don’t even saute any onion or garlic. I like using garlic and onion powders for flavor, and it turns out perfectly! 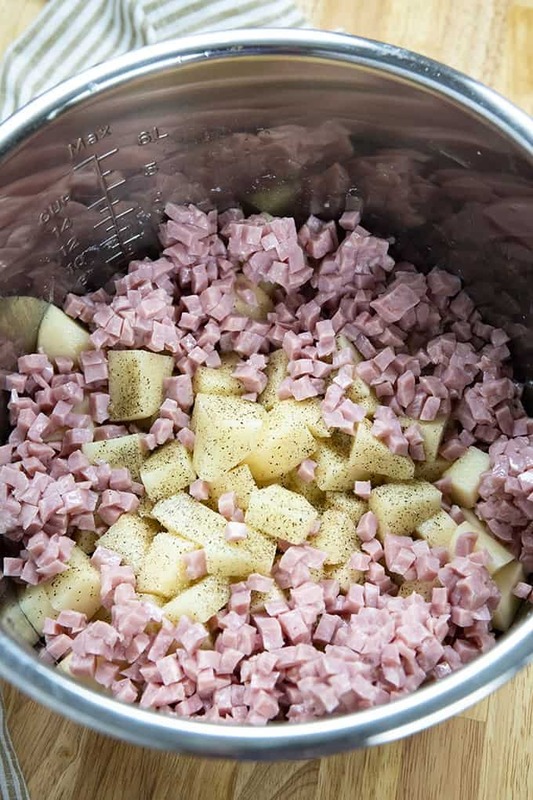 Next, you will add in your pound of cubed or diced ham. I purchase a pack of diced ham from the grocery store. But, you can absolutely use leftover ham if you have any. Go ahead and sprinkle in your seasonings, and add your chicken broth. The broth should completely cover the potatoes. This will be anywhere from 4-5 cups depending on the size of your pot. Add the lid to the pot and seal. Then, set to manual for 8 minutes. It will take about 10 minutes for the pot to come to pressure. After your timer has gone off, you can carefully do a quick release. Then, you will add in your milk and sour cream. Then, you will want to turn the pot to saute. Add in the cornstarch slurry and whisk it in until the soup has thickened up. Next, stir in the cheese and serve! 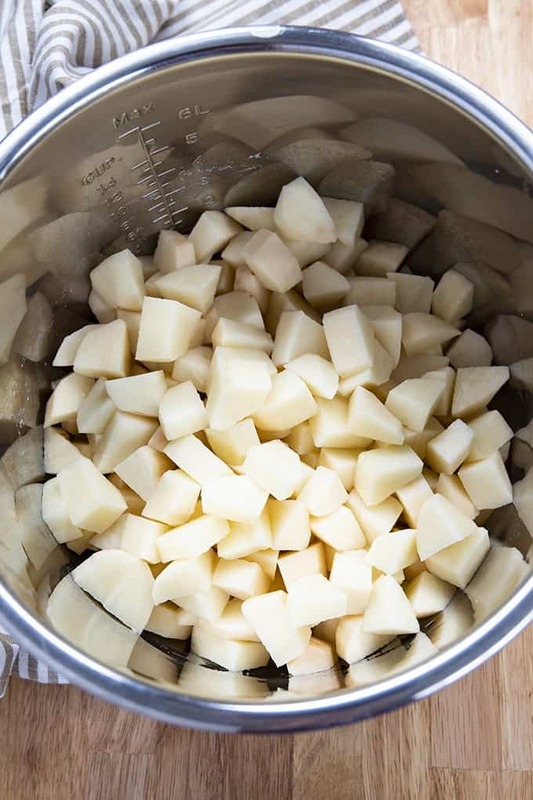 Add your peeled and cubed potatoes to the bottom of your instant pot. Add in the ham, garlic powder, onion powder, pepper, salt, and chicken broth. Place the lid on the instant pot and seal. Turn the instant pot on Manual for 8 minutes. When the timer has gone off, do a quick release and carefully remove the lid. Stir the milk and sour cream into the soup. In a small bowl mix together the cornstarch and water. Turn the pot to saute and whisk in the cornstarch and water mixture until the soup has thickened. Turn the pot off and stir in the cheese until melted. Serve topped with green onions and extra cheese if desired. NOTE: This recipe has been tested in a 6 quart and 8 quart instant pot. Be Sure to Try These Other Instant Pot Favorites! Can you add mushrooms to this? Add anything you want. I have added a can of creamed corn. Perfect cold weather soup. Turned out tasty and perfect. Best soup ever!!! Cant wait to make it to take to my next potluck dinner!!! Easy and super delicious!! Thank you for sharing!!! This was FANTASTIC!! It had such great flavor and very simple to make. A real hit in my house! Tried this soup recipe tonight after working all day. Delicious! Didn’t change a thing! Husband loved it too. Definitely a keeper! Don’t know what’s wrong with my pot! I really want to make this soup but it’s been 20 mins and still not come up to pressure! Made it tonight! Loved it. So easy and flavorful. Made a ton-way more than 4 servings. And it was more thick than I like so next time I won’t add the slurry. I also like more ham to potatoes ratio. Potatoes were done perfectly. Great warm comforting soup for cold days. Thanks for the recipe. Made this tonight and every bowl was empty! I couldn’t believe how quick and simple it was. So much easier than my usual stovetop potato soup recipe which requires making a rue and a million other steps. Delicious — taking the leftovers for lunch tomorrow. I will definitely make this again. Thanks for the great recipe! 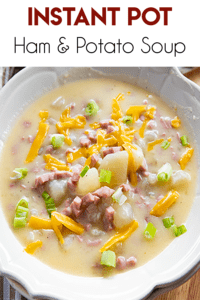 Made this last night – fantastic Potato Soup recipe for the Instant Pot!! Absolutely perfect for a cold, rainy, October day! We LOVE soups in our house and this recipe will definitely be added to the regular rotation! I have a 3 quart Instant Pot, so I halved the recipe and it turned out wonderful!! Thank you for a great recipe. I have never been much of a soup person, but this one sounded really good. I am glad we made it since it was the best soup I have ever had in my life. Once it cools off more here I am sure we will be making it often. Turned out delicious!! Will definitely make again! This is my kind of soup! Looks delicious! This looks really comforting! Definitely a must-make!! Looks so delicious! I can’t wait for soup season! That looks so good, I want this for dinner! New instant pot user and constantly looking for good recipes to try, this one filled the bill! Easy to prep ingredients, good instructions and wow, what great soup! Was a bit concerned that there was not enough seasoning however it was perfectly seasoned, not salty and the onion powder was the perfect amount. Thanks for sharing this recipe, very happy husband now!